Enishi, Shien's Chancellor, Grandmaster of the Six Samurai, Hand of the Six Samurai, Great Shogun Shien and Shadow of the Six Samurai - Shien appear in this card's artwork. The event in this card's artwork appears to follow the event depicted in the artwork of Face-Off. The effect of "Evenly Matched" does not target. The opponent player chooses the cards to be banished by the resolution of "make your opponent banish cards from their field face-down so they control the same number of cards as you do". If "Evenly Matched" is activated from your hand while you control no cards, you will control 1 "Evenly Matched" when resolving its effect. Therefore, the opponent player must banish cards from their field face-down so they control 1 card. : If "Evenly Matched" is activated from your hand while you control no cards, does the opponent banish all cards they control? Token Monsters cannot be banished face-down. If your opponent only controls 4 "Sheep Tokens" and you only control a Set "Evenly Matched", even if your opponent controls more cards than you do, you cannot activate "Evenly Matched". : Can "Evenly Matched" be activated if the opponent only controls Token Monsters? If your opponent controls "Panther Warrior" and 4 "Sheep Tokens", and you only control a Set "Evenly Matched", you can activate "Evenly Matched". In that case, since Token Monsters cannot be banished face-down, your opponent only banishes "Panther Warrior" face-down. (The 4 "Sheep Tokens" remain in the Monster Zone. ): Can "Evenly Matched" be activated if the opponent controls a Token Monster and another card? When your opponent activates "Evenly Matched", you perform the resolution of "make your opponent banish cards from their field face-down". 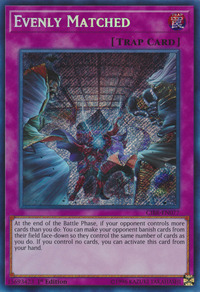 This resolution is not affected by the effect "This card is unaffected by the effects of Trap Cards" of "Tenkabito Shien". Therefore, if your opponent activates "Evenly Matched" while you control 2 face-up copies of "Tenkabito Shien", you must banish cards face-down so you control 1 card. (You banish 1 "Tenkabito Shien" face-down. 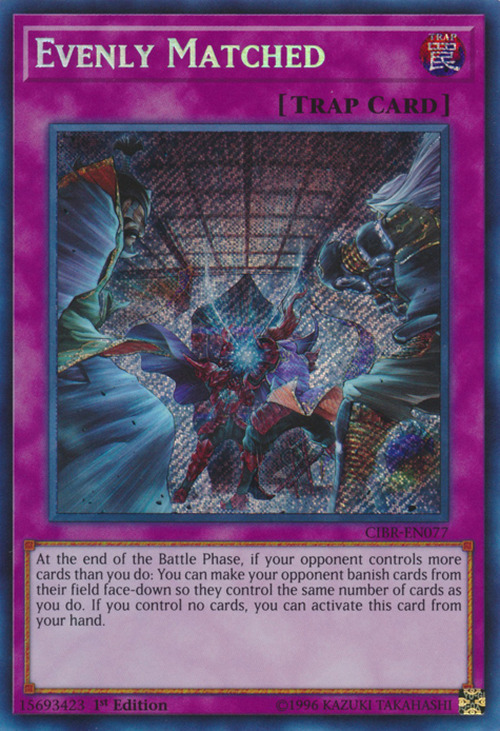 ): If the opponent activates "Evenly Matched" while you control "Tenkabito Shien", how do you resolve the effect? When your opponent activates "Evenly Matched", you perform the resolution of "make your opponent banish cards from their field face-down". This resolution is not affected by the effect "Cannot be destroyed, or banished, by card effects" of "Metaphys Executor". Therefore, if your opponent activates "Evenly Matched" while you control 2 face-up copies of "Metaphys Executor", you must banish cards face-down so you control 1 card. (You banish 1 "Metaphys Executor" face-down. ): If the opponent activates "Evenly Matched" while you control "Metaphys Executor", how do you resolve the effect? If your opponent activates "Evenly Matched" while you control "Miracle Jurassic Egg" and "Ultimate Conductor Tyranno", you must banish cards face-down so you control 1 card. Since "Miracle Jurassic Egg" cannot be banished while it is face-up on the field, you must banish "Ultimate Conductor Tyranno" face-down. : If the opponent activates "Evenly Matched" while you control "Miracle Jurassic Egg", how do you resolve the effect? Neither player can activate "Evenly Matched" while the effect of "Imperial Iron Wall" is applying. When resolving the effect of "Evenly Matched", if the effect of "Imperial Iron Wall" is applying, the resolution of "Evenly Matched" is not applied. : Can "Evenly Matched" be activated while the effect of "Imperial Iron Wall" is applying? Since the opponent player is the one who banishes cards when the effect of "Evenly Matched" is applied, you cannot activate "Evenly Matched" if you control "Chaos Hunter". (Conversely, you can activate "Evenly Matched" if your opponent controls "Chaos Hunter". ): Can "Evenly Matched" be activated while the effect of "Chaos Hunter" is applying?